Adama Vegan Comfort Cuisine offers a safe haven for vegans and gluten-free guests alike, as well as a unique dining experience for anyone simply interested in delicious and healthy food. Although the Chapala Street restaurant opened in May 2011, it wasn’t until about a year ago that they made the switch to a gluten-free kitchen, explained owner and head baker Deeahna Arrieta, and they haven’t looked back since. The change has gained the restaurant more customers, she said, estimating that about 50 percent of whom have gluten-free diets. “This kind of cooking is a daily science experiment,” she said. “I’m constantly manipulating basic ingredients to make sure a dish hits that comfort spot.” In other words, when you order a quiche at Adama, you’ll get something that actually tastes like quiche, even if it is vegan and gluten-free. Adama’s casual atmosphere is refreshing for a place that observes such strict dietary concerns. The eclectic mix of décor, textiles, and furniture combined with the cozy dining nooks and friendly service of the staff will make you feel like a regular, even if it’s just your first visit. To start your day off in a vegan, gluten-free way, try Adama’s breakfast selections on Saturday or Sunday mornings starting at 9 a.m. 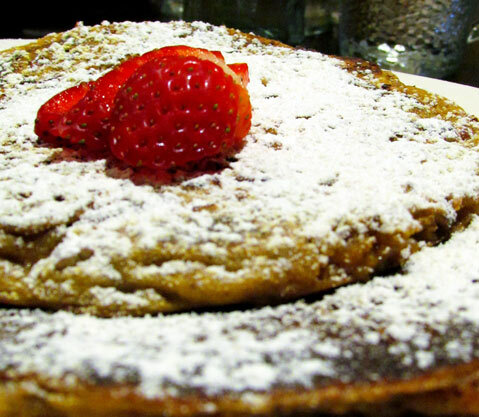 They recently brought back pumpkin pecan pancakes, a crowd favorite and their best-selling dish on the breakfast menu. The contrasting textures of the crispy toasted pecans and the creamy pumpkin make for a rich and warming meal. The cinnamon pumpkin flavor is even sweet enough to forgo the maple syrup if you want to keep it light. Try their veggie skillet and chilaquiles too if you’re craving something savory; they use vegan cashew cheddar cheese made “from ground cashews, agar, miso and nutritional yeast” to garnish seasonal vegetables. Because of Adama’s specialty menu, you’ll overhear diners tell their waitress they made a special stop in Santa Barbara just to eat at their favorite vegan restaurant. It’s no wonder why their food has been so well-received: if you can make comfort food out of healthy and clean ingredients, it’s a recipe for success. Visit Adama at 428 Chapala Street. Call 805-560-1348 or see adamavegan.com.